Ever since the day the first feline became a house cat, destructive cat scratching has plagued owners. All the affection and loving care owners shower upon their cats can feel like wasted energy when the thanks they get looks more like hatred: shredded furniture, carpet and curtains. It’s a normal human response to be angry or frustrated about damage inflicted by cats’ scratching, but equally normal is a cat’s need to scratch. Cat scratching is a behavior that fulfills both physical and emotional needs. Cats scratch to stretch their bodies, maintain their hunting and climbing skills, groom their claws and mark their territory, showing they’re in a safe space. However, these behaviors cats exhibit to establish a safe living space can be anything but pleasant for their human companions. This can lead frustrated owners to take drastic measures to modify behavior, but those decisions can be risky, especially when it comes to a permanent and potentially harmful practice like declawing. Many pet owners believe that declawing their cats is a harmless and quick fix for unwanted scratching, similar to trimming one’s nails. However, if a declawing procedure were performed on a human being, it would be like cutting off each finger at the last knuckle. Declawing is an irreversible measure to address a normal behavioral issue in cats. Declawed cats may be less likely to use a litter box, more likely to bite and the disruption of the natural scratching behavior can cause lasting physiological problems. That sentiment is echoed by national organizations such as the American Association for Feline Practitioners, which deems the practice of declawing an ethically controversial procedure that is not medically necessary in most instances. In fact, declawing cats is now illegal in several U.S. cities. Find alternatives to declawing, and cat-scratching solutions, at savethecouches.com. 1. Routinely trim nails. Regular nail care is an important part of general care and hygiene for your cat, but it can also help prevent scratching damage by eliminating the sharp, destructive claw tips. Properly trimmed nails are less likely to snag or split, and cats with well-trimmed nails are less likely to resort to scratching as part of their own self-grooming rituals. 2. Create scratch-friendly zones. Keeping cats from scratching areas you don’t want them to bother is far more likely if you provide areas where they can scratch at will, such as scratching pads and posts. Pair these scratching areas with a product such as Feliscratch by Feliway, which is clinically proven to prevent destructive scratching by redirecting cats to scratch in the right place. Cats are attracted to the drug-free, naturally derived product and will feel compelled to scratch where it’s applied, leaving that chair or couch alone. “Cat owners can now have damage-free home decor without putting their cats through the stress and potential physical harm of the painful declawing procedure,” Tynes said. 3. Reinforce off-limits areas. Cats are highly tactile, so applying textured materials like double-sided sticky tape or rough, crinkly aluminum foil to areas you don’t want scratched can be an effective deterrent. 4. Consult a behaviorist. Not all cases have easy answers, but an expert with experience in animal behavior can provide guidance based specifically on your cat’s personality and circumstances to help create a custom solution. 5. Eliminate negative reinforcements. Avoid punishing your cat for undesirable behavior. This includes shouting, spraying with water or swatting your cat. Punishment can increase stress and anxiety. It can make the problem worse and may even make your cat afraid of you. Designating a spot for your cat to safely scratch is one of the most effective ways to minimize damage to your possessions. A homemade scratching post is a quick and easy project. 1. Cut foot-long length of 4-by-4-inch wood and a 1-foot square piece of plywood. The exact sizes can vary, but these are good starting points that you can adjust up or down, depending on your space. 2. Sand away splinters and rough edges. 3. Add a sturdy fabric wrap or paint to lend aesthetic appeal to the plywood base. 4. Wrap the post tightly with heavy-gauge rope or carpet scraps (or both), securing tightly with glue and reinforcing with a staple gun. 5. Securely attach the post to the base using a long bolt. 6. Place the post in an area your cat enjoys spending time, and consider adding a pheromone therapy spray to attract your cat to the post. Hooch nestled in the "Dog-on Bag." ​When Hazel Smith decided to bring a friendly special needs Chihuahua into her home, she never imagined how he would change her life. A retired police officer, Hazel suffered from agoraphobia where even going outside to cut her grass was challenging. She was on several medications to help manage the symptoms of agoraphobia. She was a prisoner in her own home. During this season of her life, her elderly Dalmatian "Binky” crossed over the rainbow bridge. The loss sent Hazel in search for a new companion. Hazel checked ads, visited humane societies and SPCAs in search for a new dog. Then finally Hazel came across an ad on Craigslist. A military family was being relocated and needed to rehome their 1½ year-old Chihuahua, “Hercules”. Hazel claimed the five-pound Chihuahua as her own and renamed him “Hooch”. “I thought it would be funny since we had a Dogue De Bordeaux”. Hazel soon learned the meaning of the term “Velcro dog” but Hooch had very good reason to not want to leave Hazel’s side. Hooch is deaf. This was a huge accomplishment for Hazel who could barely be in her own yard without anxiety setting in. Every day Hooch and Hazel would go out for a bike rides and people would ask about her homemade Hooch carrier. She decided to venture out even more and make more carriers in different designs and then set up a table at a local Bark in the Park event. By the end of the day she had nearly sold out of her Dog-On Bags. A business was born. Now, Hazel and Hooch have an in-home business, a website, and several retailers carry the Dog-On Bag. She has even expanded the reach of the Dog-On Bag as far as Italy. Her new-found strength and courage even set her on stage to audition for Shark Tank in seeking help for her business. 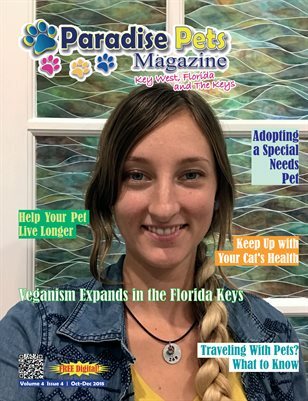 Click to Read the Free Digital Edition Now! 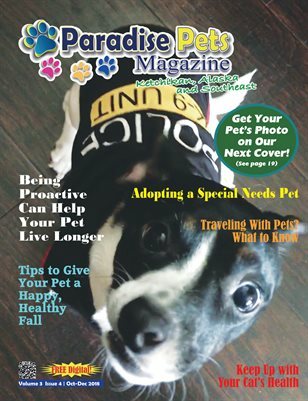 This story was originally published in Paradise Pets Magazine, Key West, FL Vol. 2 Issue 4. You can read the digital edition of this issue free by clicking the cover image. How Happy Is Your Pet When Eating?